Cal students have never been quiet. Since the first class -- the "12 Apostles" of 1873 -- Cal men and women have been creating their own identity, creating their own activities and lore, some of which has survived over the years (such as the Stanford rivalry), others of which haven't (such as the textbook burial traditions). Some of our traditions, such as Card Stunts, have even been adopted by other universities and sports fans around the world. Here you can glean through a sampling of our traditions. During the 19th century, "cinch" notices (of academic deficiency) were publicly posted in the bulletin board in North Hall. The man who posted them was known to the students as the "Angel of Death." Andy L. Smith was the coach of the Cal football team during the triumphant years of the 1920s. For years after his death in 1926, Professor Garff Wilson has read a eulogy in a darkened Greek Theatre annually. 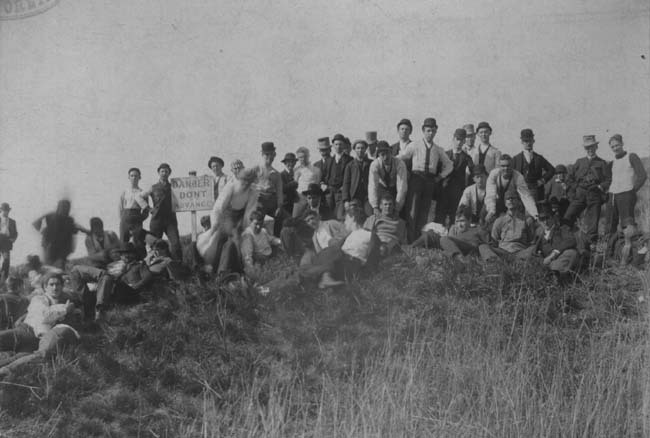 On March 18, 1905, the class of '07 and '08, then Freshmen and Sophomores, joined together to build a "C" in the hills by Berkeley. This was the end of the "Rush"; the Freshmen and Sophomores worked together for the first time, rather than fighting against each other. It was traditionally the sophomore's responsibility to take care of and guard (particularly when Stanford students may try to wreck it before a big game) the "C," and every Charter Day there was a ceremony in which the deed was transferred from one sophomore class to the next; the deed disappeared in the move to Doe Library. Like other traditions at Cal, the Burial was modeled after Yale's Burial of Euclid tradition. From 1878 - 1903, every Freshman class would, at the end of the school year, bury their main textbooks, Bourdon's Elements of Algebra and Minto's Manual of English Prose Composition. Over time the ceremony became more and more elaborate, complete with costumes and long processions (which the sophomores would, of course, always try to break up). The ceremony died out as the undergraduate population increased, and "rowdy elements" from surrounding communities were able to take part and turning the student fun into riots. In the Cal-Stanford game of 1908, spectators on both sides wore rooter caps which were one color on one side and another color on another side. During half-time the students of both sides would reverse their caps, creating a message in block letters. Beginning in the Big Game of 1914, students used colored cards to spell out messages in the rooting sections. These became more and more elaborate, eventually with an invisible pen writing "Cal" in the Cal script. From the 1870s until 1911, Cal upperclassmen wore "plugs," or top hats: black for seniors, grey for juniors. Very much like the hip baseball cap of today, the more used, worn, and battered a plug was, the cooler it was; so the students would kick around their hats. The Class of 1913 was the first to wear the "senior sombrero." This was popular until the late 1920s and, it is rumored, is the inspiration for the U.S. Forest Ranger hat. On the corner of Hearst Avenue and Gayley Road lies the Founder's Rock, the spot, according to college lore, where the 12 trustees of the College of California stood on April 16, 1860, to dedicate the property they had just purchased. This is, supposedly, the same spot where Frederick Billings stood in 1866 when he remembered Bishop Berkeley's verse -- "Westerward the course of empire takes it way" -- and thus inspired the name of the new city. A plaque was put on this spot on Charter Day in 1896. After the banning of the "Charter Hill Rushes" (real, down-and-dirty freshman-sophomore fighting) in 1907, this tradition -- of tag-of-war contests, push-ball contests, and so on -- took its place. When a 12-man track team returned from a series of meets on the East Coast in 1895, having been triumphant beyond expectations, their logo -- the grizzly bear embroidered in gold on their banner -- immediately became Cal's mascot. At the end of the Fall semester of 1930, a bunch of students asked that The Hanging of Danny Deever be played on the Campanile bells on the final day of classes, as they had heard on the Campanile, by chance, the end of the previous semester, Spring 1930. The tradition just stuck from there. Long before Labor Day was a national holiday, Cal had its own Labor Day: leap year. 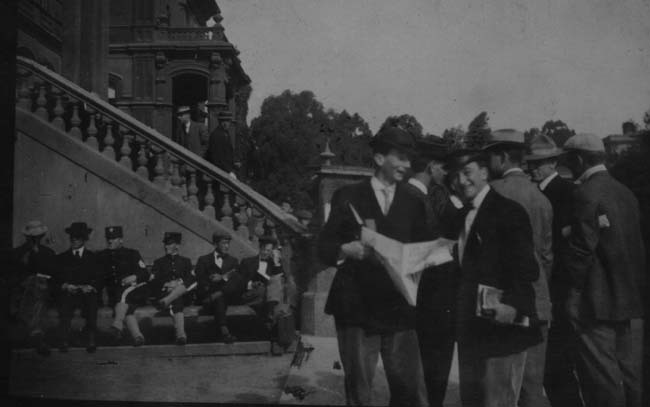 First held on February 29, 1896, the students, faculty, and staff of Cal spent the day -- at the suggestion of Regent Jacob Reinstein '73, who wanted to dramatize for the legislature Cal's lack of money -- working together helping repair the area around North and South Halls. The most visible product today of these labor days was the trail to the "Big C" from 1916; and after 1932, the day of work declined, eventually becoming a parade. A Short-Hair Pointer named Ludwig became Cal's unofficial mascot in 1960. 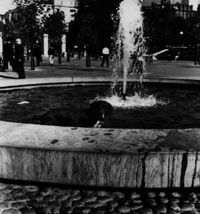 Right after the new Student Union building was completed, he would spend his days hanging around the Dining Commons but then quickly found the fountain. He became famous for spending his days playing with students around the fountain and leaving for home promptly at 5:30pm. He was so popular, in fact, that the Regents named the fountain after him in 1961! But all this lasted only until the fall of 1965, when his owners moved to Alameda. This was the favorite resting spot of the idle men on campus. Students would spent their afternoons, often when they were supposed to be on class, sitting with their friends on the steps on the south side of North Hall. Classes would gather here; men would watch women go by here; and so on. When North Hall was condemned to be torn down in 1917, 700 alumni gathered by the steps "to say farewell." President Benjamin Ide Wheeler summarized the steps of North Hall perfectly: "The shrine to those who would loaf and invite their souls." At first, Cal students wanted to use a bear cub as their mascot: a real-life bear to cheer on their students during the football games. As the cubs grew, this idea was quickly and wisely abandoned. In 1941, however, a student inspired by William Rockwell '48 came to the game dressed in a padded size 54 yellow sweater, blue pants, oversized shoes, large white gloves, and a papier maché head caricature of a bear. And thus we have the Oski we know and love today. Every year, beginning in 1911, Cal held a competition for an original play by an undergraduate woman about the transition from girlhood to adulthood. The wining play was performed, sometimes with 400-500 Cal women taking part, at first under the oaks by the eucalyptus grove and then in the Faculty Glade. The tradition died out in 1931. This was the one time per year when the Stanford Axe was taken from its vault and shown to the student body, with alumni retelling the story of its capture. After 31 years, the tradition died out in 1930 when Stanford recaptured the Axe. But the tradition of a Rally the night before the Big Game continues; now, only when Cal is in possession of the Axe does the Rally become an Axe Rally. A night-time, mid-October pajama parade first held in October, 1901, as a "costume stunt." Although there were at first skits and stunts during the parade, it eventually transformed into a fashion show of sorts. Also known as the Charter Hill Rushes, because that's where they took place, Rushing was the contest between the freshmen and the sophomores to wrestle each other into submission. The first rush happened with the first class in the early 1870s, and continued until 1904--sometimes meticulously planned, sometimes spontaneous fighting. The "Big C" was built between the freshmen and the sophomores in 1905 as a symbol of the end of the Rush, to be a sign of school, rather than class, unity. University regulations long prohibited any sort of political campaigning on campus. By the 1930s, as a result, the portion of Telegraph Avenue right outside the main entrance to campus, Sather Gate -- this land was, at this time, still public property -- became the spot where all the political demonstrating and activism took place. This was, in fact, the central issues in the free speech movement of 1964. Dedicated on April 14, 1908, the Senior Men's Bench, on the sunny corner between the south steps and the basement entrance to North Hall, Cal students would loaf here and "pipe the flight" (watch the girls go by) during the days. The bench lost its significance in 1917, when Wheeler Hall was built, causing fewer people to walk by the bench. The bench was moved a few times during the next few years until 1937, when it was finally placed by Moses Hall (then Eshleman Hall), where it sat for the next half-century until it was removed just very recently, without anyone noticing. The Sophomore lawn is a strip of grass between Doe Library and California Hall, where sophomores would gather from 1910 on. As freshmen passed the lawn -- not knowing it was under the sophomore's jurisdiction -- the sophomores would haze them for walking on their property. But after 1941, when fewer students needed to go to California Hall (Sproul Hall was the new administrative center) and hazing was banned, the lawn lost its significance. The Stanford Axe was originally an ornament, albeit one with a 15-inch steel blade on a four-foot handle, displayed in the Stanford rooting section in the Stanford-Cal baseball game on April 15, 1899. After the game, Cal students wrestled the Axe from the Stanford students and evaded the Stanford students (helped by the San Francisco police) and were able to bring the Axe across the bay back to campus. It remained there until 1931, displayed annually during the Axe Rally the night before the Big Game. In that year, 21 Stanford students invaded campus and -- with one posing as a photographer wanting a picture of the Axe -- they tossed a tear bomb to the Cal students, letting them reclaim it. Three years later, Cal and Stanford alumni agreed together to let the Axe become a trophy awarded annually to the winner of the Cal-Stanford Big Game. Between 1917, when Wheeler Hall was opened, and 1934, when the Oak died and was removed, the Wheeler Oak, standing right outside the front of Wheeler Hall, was one of the favorite loafing spots for Cal students.